When you are looking for a Gluten Free Bakery in Westchester, think of Baked by Susan, located at 163 Grand Street in Croton-on-Hudson in Northern Westchester County. At Baked by Susan, we proudly make delicious gluten-free treats such as cakes, cupcakes, blueberry muffins and chocolate chip muffins, chocolate chip cookies, brownies, and macaroons. Our award-winning carrot cake and cheesecake can also be made gluten free without sacrificing the flavor! We have four fabulous gluten-free flavors; chocolate, vanilla, carrot, and cheesecake (without the crust). Our design team takes great pride in understanding that if you have an allergy or a dietary restriction, you shouldn’t be without delicious cakes, cupcakes or cookies! When people hear “gluten-free” they often assume “terrible taste” but this doesn’t have to be the case! 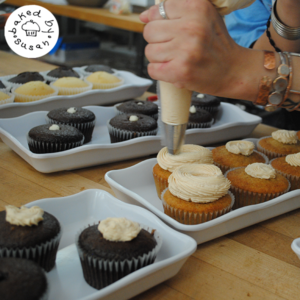 At Baked by Susan, we eliminate the gluten without sacrificing the flavor! So, come in and try one of our gluten-free treats, we promise, you’ll never know the difference! Whether you’ve been diagnosed with Celiac Disease or gluten-intolerance, or you are cutting gluten out of your diet for other reasons, it can at times feel limiting and frustrating, like you’re suddenly being left out of the club. Let Baked by Susan help you by making your transition a bit easier by supplying you with your favorite bakery treats…sans gluten! Baked by Susan wants you to know that we are committed to making sure Westchester now has quality gluten-free options when it comes to baked goods! For kids with a gluten intolerance or life-threatening food allergies, it can be especially difficult to see other kids munching away at sweet treats while they have to abstain. Parents can now minimize this by ensuring that kids with gluten allergies will have their own cupcakes at parties. So, when you’re having a birthday party, be sure to make a quick stop at Baked by Susan in downtown Croton for some gluten free sweets, they’re sure to be the hit of the party! If you’d like more information on our Westchester gluten-free bakery or any of our many other delicious treats, please contact us at 914-862-0874. We look forward to taking care of your special, gluten-free requests!